Easy Cream Cheese Apple Dip: A creamy, naturally sweetened dip that melts in your mouth! Perfect to serve with apples or assorted fruits and crackers. Fall is around the corner and with it comes delicious ripe apples and football. You may be thinking, What do football and apples have in common? Football means parties. And parties NEED this Cream Cheese Apple Dip. 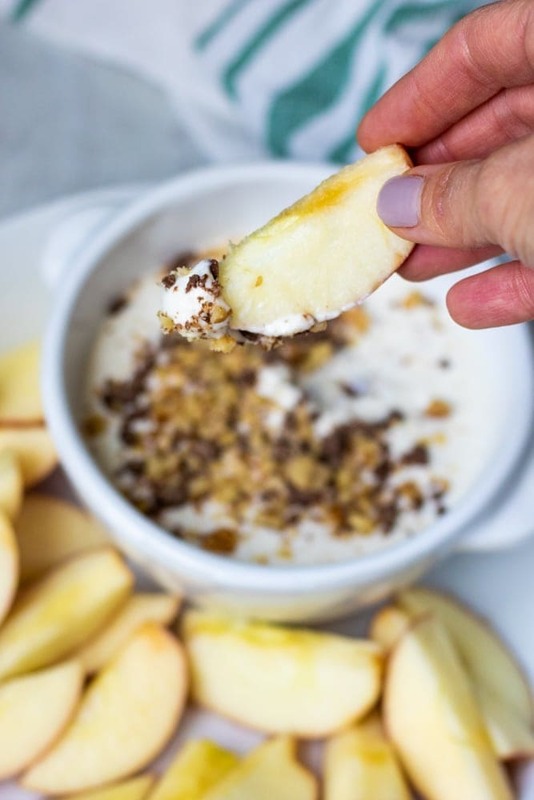 This naturally sweetened apple dip tastes just like Caramel Apple Dip, without the caramel! The maple syrup and vanilla extract work together to create a rich, sweet taste that is reminiscent of caramel–without the refined sugar. It is only a matter of minutes needed to mix together this Apple Yogurt Dip, but it can be prepared a day in advance, making it a perfect make-ahead recipe for a party or gathering. In a large mixing bowl, combine cream cheese, yogurt, maple syrup, and vanilla extract. Using a hand held mixer, make sure to mix until smooth and creamy. This allows dip’s flavors to meld together as the dip chills. Refrigerate for at least 20 minutes or up to 24 hours before serving. Serve cream cheese dip as is with apples, graham crackers, or pretzels. Make a Healthier Version of Toffee Dip by topping with chopped chocolate and nuts. You can use any variety of apples you like for this dip, but it is important to prepare them so that they do not turn brown after slicing. Slice apples into 1/2 inch wedges. Place sliced apples into large bowl. Cover apple slices with pineapple juice. The pineapple juice’s ascorbic acid will help keep the apples from browning. Let apples sit in pineapple juice for 20 minutes up to 24 hours. Drain and serve apples with dip. Do NOT discard pineapple juice. You can use it for Pina Colada Smoothies, Zucchini Bread, or even to cook Chicken Breasts. 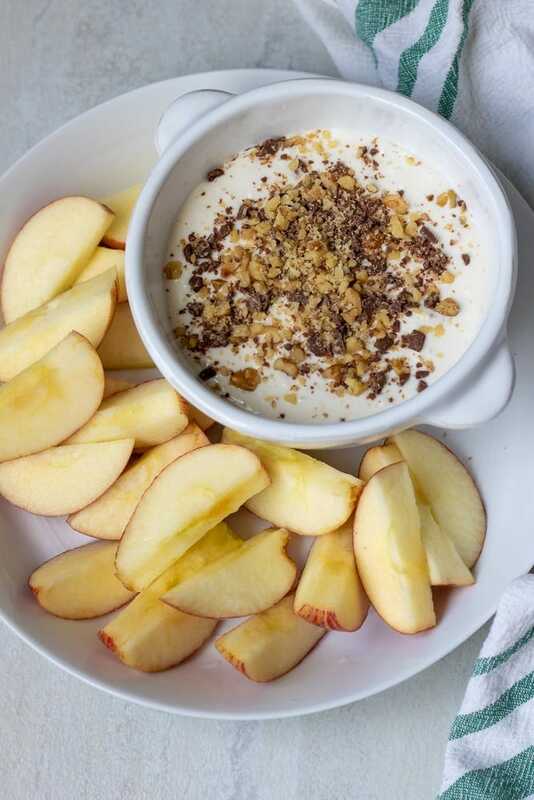 This apple dip is naturally gluten-free and egg-free. You can use full -fat cream cheese or low-fat, but fat free is not recommended for the best flavor. It is important to use room temperature cream cheese for a smooth dip. Leave your cream cheese out for 1-2 hours at room temperature. If you forgot to leave your cream cheese out, get a bowl larger than the package of cream cheese and fill with hot water, place the foil-wrapped pack of cream cheese in the hot water and let sit for 3-5 minutes. You can use Greek yogurt or regular yogurt–just be sure it is PLAIN and not sweetened. Cream Cheese Apple Dip will last in fridge for up to 4 days. A creamy, homemade cream cheese apple dip made without refined sugar. Combine the cream cheese, yogurt, maple syrup, and vanilla until well combined. Top with chocolate and nuts if desired and serve with apple slices. You can use Greek yogurt or regular yogurt--just be sure it is PLAIN and not sweetened. Wow that looks amazingly easy! I will definitely be using this recipe at my next get together! This dip looks great, and I love that this post is full of great tips! (who knew about softening the cream cheese?!) I love that it’s fairly healthy party food. Your Caramel Apple Dip looks delicious and a great tip to keep the apples fresh looking. Hope you are staying warm and cozy on this cold day and thanks so much for sharing with Full Plate Thursday. This looks so delcious and will be on my to do list. I have seen your recipe at the Simple Super Tuesday linky party! Thanks Hadia–It is easy and delicious!! This dip looks amazing!! And thank you so much for the pineapple juice tip! I will have to start using that instead of lemon juice! Thanks so much for linking up to Creative K Kids Tasty Tuesdays. I’m pinning this to the Tasty Tuesdays Pinterest Board. We would love to have you join us again this week! What a great tip! I never would have thought of using pineapple juice, but that’s brilliant! Thanks Katie. It keeps the apples from not being bitter from lemon juice. Great tip on the pineapple juice! I am always looking for fast but healthy snacks for the kids – and I’m sure they are going to love this one! This is a hit with my kids for sure. I love the pineapple juice tip. There is nothing worse than serving brown apples at a party. This is such a great recipe! It’s easy to always have apples and cream cheese on hand ready to go. I love having something I can pull out of the fridge when company shows up or we have a last minute something or other to attend. Thank you. Mirlanda, this would be a great thing to whip up last minute. I do that often myself. Yummy! I am always looking for a new dip to take to a party and this is it!!! Thanks Jennifer. I am sure the party guests will devour this. Thanks. It is too easy not to try! Such a fun recipe! I love the crunchy toppings! Thanks Lise–it adds just the right touch. This looks so easy and tasty! We are headed to an early Halloween party in a couple weeks and I’m thinking this will be the perfect snack to take along with us! Yea!!! This will be a huge hit for sure!